The mechanism provides simplified assembly of the Wall Bed, simple and safe dual piston system makes opening and closing user-friendly. 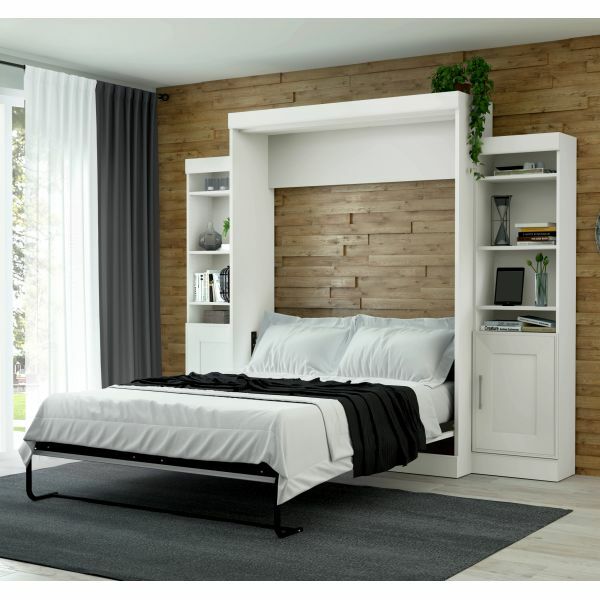 Bestar Edge by Bestar Queen Wall Bed with two 21" Storage Units in White - Create a multifunctional room in your home with a wall bed from the Bestar Edge Collection. A unique blend of versatility and efficiency with a trendy design. Start saving space today and enjoy more space now! The kit comprises a queen size wall bed and two 21" storage units with doors. The mechanism provides simplified assembly of the Wall Bed. Increased comfort due to Euroslat mattress support system. Simple and safe dual piston system makes opening and closing user-friendly. Easy to use; use the handle to pull the bed towards you to lower the bed and flip the leg down onto the floor. Accommodates a standard queen mattress up to 12" thick and weighing at least 70 lbs. The bed when opened will require a clearance of 92.5" from the wall extending into the room. Bed must be secured to the wall into wood or metal studs. Mattress not included. Box spring not required. 2 fixed and 4 adjustable shelves in each storage unit to maximize your options. 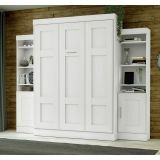 The reversible doors provide closed storage on bottom section of the storage units. Assembly required. Easy to install. Wall bed : 65.1" (W) x 20.1" (D) x 89.4" (H). 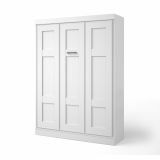 Storage unit : 21" (W) x 12.1" (D) x 79" (H).